When Myrtle and her friend Miles set out for adventure on the high sea, they assume most of the trip’s excitement will result from shore excursions to charming Alaskan villages.They feel as if their ship has come in. But when a fellow passenger disappears, Myrtle realizes she must seize the helm and find the killer…before more souls are lost. Published by Elizabeth Craig, 2016. First edition. August 11, 2016. Copyright © 2016 Elizabeth Spann Craig. Written by Elizabeth Spann Craig. Myrtle Clover took a steadying breath. She reminded herself exactly why she needed her housekeeper, Puddin’s, help. Myrtle was going on an Alaskan cruise with her son, his family and her friend, Miles. This meant someone needed to take care of her house—water the tomatoes, feed her cat, mow her grass. Despite Puddin’s complete and utter incompetence, Myrtle must retain her patience and ensure that both Puddin and her husband, Dusty, were onboard. “Okay then, really all I need you for is to water the tomatoes. But the cat must be taken care of. If you want to outsource that to Dusty, that’s your own business,” said Myrtle. Myrtle glanced around her living room, allegedly under the tender loving care of Puddin. Dust bunnies had formed rival gangs and threatened to hijack her home while she was gone, turning it into their own personal warren. Every bit of silver she had in the house looked like brass. The wooden furniture was dull from lack of polish. The rug had black cat hair threaded through it. “If you say so. If you actually clean today, it will probably keep just fine until I get back,” stressed Myrtle. Because cleaning was never a given when her housekeeper came by. “Alaska? Well, at this time of the year it’s probably still pretty chilly, yes,” said Myrtle. As if on cue, Dusty, wearing frayed khakis and a grass-stained checkered button-down shirt, pushed open the front door. “Too hot to mow,” he muttered to himself as he opened Myrtle’s refrigerator and pulled out a pitcher of lemonade. He poured himself a generous glass and, when Puddin, gave a loud, suggestive cough, poured her one too, bringing it to her in the living room where she plopped down on Myrtle’s sofa. “I’ve had just about enough of both of your foolishness today. Dusty, it looks like an African savannah out there. The grass has to be cut regardless of the temperature. But I’m also concerned about the care and feeding of Pasha,” said Myrtle briskly. “The black cat,” said Myrtle. “That witch-cat!” said Puddin at a volume guaranteed to make Myrtle’s blood pressure rise. “That will be enough of that nonsense, Puddin. It’s an easy enough job, Dusty, and the chore will apparently fall to you since your wife is engaging in histrionics at the thought,” said Myrtle. “You let her in at night and give her cat food. You let her out in the morning. You make sure her litter box is in good shape.” Myrtle pointed to the stack of cat food cans, the litterbox, and the extra litter. Dusty grunted again. It seemed to be an assent, although a reluctant one. “That’s a lot of coming by,” he said. “I’d rather leave them out there in the yard until I leave. It’s important for Red to have a visual reminder before our trip,” said Myrtle. When Myrtle pulled her tremendous collection of garden gnomes out, it provided a subtle warning to her son that he needed to watch himself. Considering Red lived directly across the street and considering the fact that he abhorred her gnome collection, it was generally an effective ploy. Dusty’s relieved smile revealed a dimple that Myrtle had never seen. The doorbell rang. Myrtle’s eyes narrowed with apprehension. “I spotted Erma Sherman lurking out there earlier. I must finish packing and organizing and don’t have time for her recitation of all the disgusting illnesses she’s inflicted with. Puddin, check the door for me.” Myrtle’s next door neighbor, Erma, was the bane of Myrtle’s existence. Erma’s goal in life seemed to be allowing her crabgrass to infiltrate Myrtle’s yard, her squirrels to steal Myrtle’s birdseed, and to trap Myrtle in conversation. “Say I’m busy,” amended Myrtle. She fled to the back. The packing was actually going pretty well. The suitcase was basically ready to go. It was a little tricky packing for a range of temperatures, but since Myrtle didn’t have a large wardrobe to start with, it wasn’t as much of a chore as it could have been. The carryon was something of a nightmare, though. “She went away,” reported Puddin loudly in a singsong tone. “Thank heaven for that,” said Myrtle fervently. “Oops, spoke too soon. Knock at the door,” said Puddin, continuing the play-by-play. “And?” asked Myrtle in an impatient voice. Puddin disapproved of Wanda, a fact that was written all over her face as she opened the door. Although what Puddin might have to feel superior about was a true puzzle to Myrtle. “No, Dan gave me a ride. Sort of. Car broke down on the way,” said Wanda with a shrug of an emaciated shoulder. “Only had to walk halfway.” Crazy Dan was Wanda’s brother. They lived at a hubcap-covered hut surrounded by rusted cars that were mostly on concrete blocks. They stuck up homemade signs on the rural highway adjoining their property, promoting their bait, psychic readings, and boiled peanuts. “Well, let’s have Miles drive you back home when you’re ready. And Dan, too, of course,” said Myrtle. Myrtle’s best friend, Miles, had learned with a good degree of horror that he was a cousin of Wanda and Crazy Dan’s. “And let’s go into the kitchen for a snack,” added Myrtle, studying Wanda’s thin frame with concern. Her invitation put Puddin into even more of a snit and she flounced off with her nose in the air. With any luck, she would work off her annoyance with housekeeping. Wanda carefully pulled out a wooden chair at Myrtle’s table and sat with perfect posture as if channeling table manners from childhood. Myrtle peered into her fridge, pantry, and cabinets before finally settling on a variety of different sandwich makings and sides, placing the assorted foods on the table in front of Wanda. She pulled out two plates, a pitcher of the lemonade that Dusty had unfortunately nearly polished off, and two glasses. Myrtle watched as Wanda devoured everything set in front of her and provided a monologue in a quiet tone as a background to Wanda’s meal. When Myrtle sensed Wanda was filling up, she waited for a minute or two for Wanda to provide the reason for her visit. “Yer in danger,” said Wanda tiredly. “Naturally,” agreed Myrtle in a pleasant tone. “Shouldn’t go on the trip,” said Wanda, giving her a sideways look. “Unfortunately, it’s too late to back out now. Red and Elaine are especially excited about the cruise. They’ve saved up for years to take a vacation like this. Land and sea—Denali and the glaciers. And I’m to help keep an eye on Jack for them from time to time so that they can have a quiet meal or two. Miles and I will play bridge and sip coffees and observe wildlife out the window and it will all be very relaxing,” explained Myrtle. Wanda shook her head. “Snow,” said Wanda in a fatigued voice, slumping in the kitchen chair a little. Puddin flounced in, hands on her hips. “Mr. Miles is here,” she announced to the ceiling since her nose was in the air while in Wanda’s presence. Miles walked in. “So you’ve got a butler now, too?” he asked pleasantly to Myrtle. Spotting Wanda, he automatically put a ready hand near his wallet. Wanda had many needs and, considering the family connection, Miles usually found himself obliging. But Wanda didn’t ask, just greeted him in a tired voice. He sat down at the kitchen table with them. Or, more truthfully, Myrtle radically revised Wanda’s horoscopes so they more closely resembled English before turning them over to Sloan to be published in the local newspaper. “Of course not,” said Myrtle in a distracted voice. She was thinking of the horoscopes and Sloan’s dismay when he had to figure them out. “Are you all packed?” asked Miles. “As well as I can be. It sounded as if I might need to dress for different temperatures. I fixed that by packing a couple of sweaters,” said Myrtle. “Oh, there’s some sort of kids club or something. Jack will play in there for a little while so that we can skip the buffet line for the main restaurant. He’ll be fine in there for one evening. But we have to book it just as soon as we get onboard the ship. Yes, I threw in a dressy top to wear with my black slacks. That will work, won’t it? You’ve been on a cruise before. I’m the one with no idea what to expect,” said Myrtle. “Or assuming you were a magician for the kids’ club,” said Myrtle. “These weren’t even necessarily unhappy people. They were giving their opinion of the trip overall. They just said that the land portion gets a little crazy with all the having to pack and unpack and then label the bags and put them outside your door for the staff to make sure they end up where you’re going. You have to make sure you cut off the old labels or the staff might send your bags back to a prior location. Can you imagine me replacing all of my wardrobe in a gift shop?” asked Myrtle. “From your lips to God’s ears,” said Miles in the fervent voice of someone who didn’t want to hear Myrtle fuss about the criminal lack of bears in Alaska. Then he jumped, eyes wide open. Which was exactly the moment Wanda appeared. She reached down to rub Pasha and Pasha rubbed lovingly against the thin woman. “Got to go,” muttered Wanda. Miles looked pained, but willing. “Guess so,” mumbled Wanda, still looking drained. She unexpectedly gave Myrtle and Miles a fierce embrace. “Be careful,” she said as she walked out through the front door. Puddin pushed herself against a wall as Wanda passed, doing her best to keep out of the psychic’s way. “And be careful walking out to Sloan’s,” added Wanda, sticking her head back in for a second as Puddin once again flattened against the wall, holding her breath so as not to breathe the same air as Wanda. I should put the finishing touches on my packing after I take Wanda home,” Miles said. Myrtle was sure that whatever Miles was doing with his packing was basically just shifting things from one side of the suitcase to the other. Miles was so particular and so neat that she knew that the items in his suitcase were color-coded, organized into zipper bags, and were something of a work of art. Myrtle, on the other hand, felt confident that she at least had everything packed that she needed. Instead of looking at her packed bags one more time before tomorrow, she grabbed her cane for the walk downtown to the Bradley Bugle office to see her editor, Sloan. Her mind wasn’t on anything but Sloan. This is why, when she hurriedly yanked open her front door, she gaped at the one person she most didn’t want to see there. Erma. Wanda had warned her, hadn’t she? Erma Sherman, Myrtle’s next door nightmare of a neighbor, grinned at her with that horrid grin. “Where you headed in such a hurry?” asked Erma nosily. Myrtle was quite certain she could walk much farther than downtown, but she wasn’t about to debate the point with Erma. Arguing with Erma, she’d learned from past experience, was completely futile in every way. “You’re right about me heading downtown, at any rate. See you later, Erma.” And she went thumping off with her cane with great determination. “Wait! Wait! I’ll drive you there. Got to go there myself,” said Erma. “Me too! I need exercise, too!” said Erma in a desperate tone. This was true. Erma did need exercise. What’s more, Myrtle could tell when she’d lost. Wanda had been right—she should have watched out as she left home. Now she was stuck. “All right then. You can walk with me,” grated Myrtle behind her clenched teeth. As she’d guessed, Erma was dying for someone to talk to. Her long-suffering immune system had just successfully battled a bizarre virus with many disturbing side effects, deftly described in some depth by Erma. Myrtle grimly forged forward. She decided that the best way to combat Erma’s assault was by launching one of her own. She settled on a different boorish tactic—talking about one’s vacation. Myrtle broke in, “Did you know that I’m leaving for a cruise?” Of course Erma didn’t. Miles and Myrtle would have been the people who told her of it, and they were the ones avoiding her at all costs. Erma gaped at her. “A cruise? You?” She burst into braying laughter. “Miles is going. Since Miles is my friend, it does not fall under the definition of a romantic trip. It’s a family trip. Red and Elaine and even little Jack are coming along,” said Myrtle. She spotted the Bradley Bugle office, now looking like a refuge for lost souls, come into sight. Elaine gave a ragged smile. “He is well-behaved eighty percent of the time. The rest is pure toddler angst.” She drove away, Jack acting as a siren as they went. “If you say so. Okay, well, I’ll keep an eye on your house for you while you’re gone. Is this one of those 5-day things?” asked Erma, still hoping to hear something negative about the cruise. “No, it’s one of those twelve-day trips with a couple of travel days,” said Myrtle, crossing the street to head for the newspaper office. “Then I’ll see you in two weeks!” called Erma as Myrtle quickly walked away. “Not if I see you first,” muttered Myrtle under her breath. Myrtle pushed open the old, wooden door to the newspaper office. As usual, it took a few moments for her eyes to adjust from the bright sunshine outside to the dimness of the newsroom. It took her even a few more moments before she spotted her editor and former student, Sloan. He was blocked by a teetering pile of old paper, newspapers, and photos. A calendar hanging on a nearby wall was seven years old. It was the land that time forgot. Sloan scrambled to his feet when he saw her. “Miss Myrtle!” He was a hefty man of Red’s age who automatically reverted to guilty schoolboy whenever he saw her. He’d been a completely unremarkable English student when Myrtle taught him. It was still hard for her to wrap her brain around the fact that Sloan was editor of the town’s newspaper. Red, in an effort to keep his mother busy, had pushed Sloan into giving Myrtle her own helpful hints column in the paper. Instead, Myrtle wrote investigative pieces as much as she possibly could. Sloan had started out as terrified of Myrtle as if it had only been yesterday that he’d endured her wrath in the classroom. Now, however, he’d grown somewhat more comfortable around her. “Boy, am I glad to see you, Miss Myrtle. I was worried you were going to fly away for your trip before we had an opportunity for a powwow,” said Sloan. He solicitously pulled out a rolling chair for Myrtle, first removing a teetering pile of papers from it. “The powwow, I’m presuming, is on the subject of Wanda?” asked Myrtle, delicately sitting in the rolling chair, which looked as if it might go careening madly across the room with her in it. “That’s right. It’s kind of a delicate situation,” said Sloan. His large and ever-expanding forehead starting perspiring. Myrtle gave a gracious nod. “For heaven’s sake, no! Don’t you dare call me. I’ve got to have some kind of crazy cell phone plan if I receive phone calls or text messages on the ship or on some of those excursions. That would cost me a mint!” said Myrtle, shuddering. Myrtle pressed her lips together in annoyance. She was ready to move past her helpful hints column and into full-time crime reporting. She loved the long investigative pieces she’d done for the paper on Bradley’s various murders. Myrtle was sure if Bradley had more crime, she’d have more stories and wouldn’t have time to do columns on stain removal. “I’ve emailed you something. 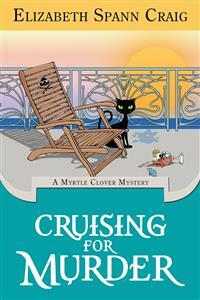 And I knew that you were going to want a report, a travel article, detailing my cruise,” said Myrtle. Sloan deflated at the word travel. “Ah. Maybe you mean a paragraph for our Town Round-Up page? Marianne Powell is visiting her sister at Lake Hartwell where they plan on getting lots of sun, eating tomato sandwiches, and waterskiing? That sort of thing?” His face was hopeful. “Great,” said Sloan. Any enthusiasm faked in his voice was not reflected in his glum features. The land portion of the trip was indeed fabulous. But it was a whirlwind of towns and modes of travel. They were on buses and vans. They saw Fairbanks, Denali (Myrtle was gratified to see a handful of bears gamboling along the mountainsides), and traveled by domed train to Seward to embark on the ship. She brought a sweater with her for when the bus stopped for photo opportunities, but was surprised to find that it wasn’t particularly cold outside. The landscape in Denali was especially remarkable—beautiful, but with a barren quality to it. The trees were stunted because of the permafrost and the unforgiving mountainsides looked lovely but vaguely threatening. Myrtle was glad she was there in the summer since she certainly didn’t feel Southerners were good at acclimating to Alaskan winters. “Don’t be a fussbudget, Miles. You adored Denali. You’d have liked us to have just left you there,” said Myrtle.